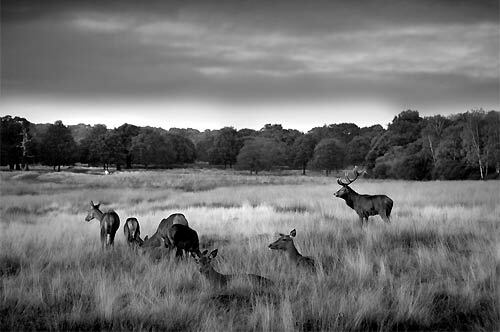 Richmond Park was originally a Royal hunting ground, so deer have been roaming the park for hundreds of years. This young red stag was kicking up quite a bit of a dust cloud as he stamped his feet during the rutting season. 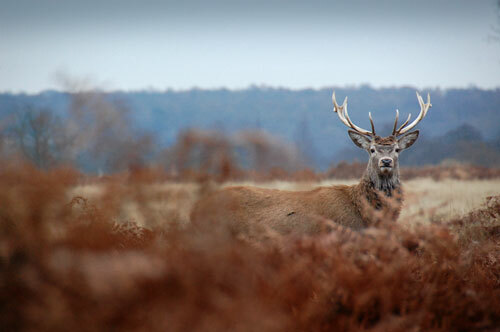 The meadow next to the Isabella Plantation car park is a common place for deer to rest during the winter. This photo was taken late in the evening in November. 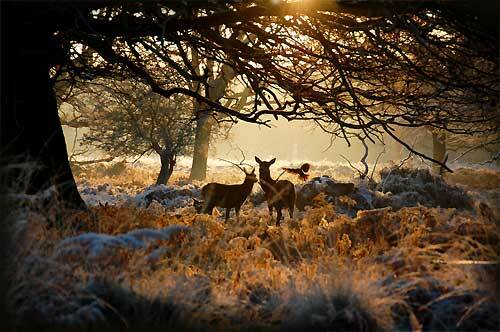 This Disney-like deer scene was captured very early one winter's morning in Richmond Park. Winter mornings are by far the best time to photograph deer as the light is just breaking the tree-line and the deer are still active. This beautiful fallow deer was feeding on its own as the ferns start to change color in autumn. 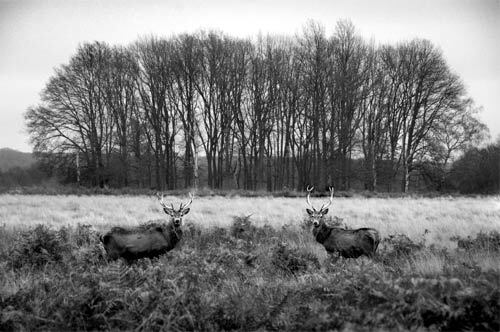 It look rather a long time for these two stags to move into such a symmetric composition during their rut in the build up to the autumn rutting season in the middle of Richmond Park. 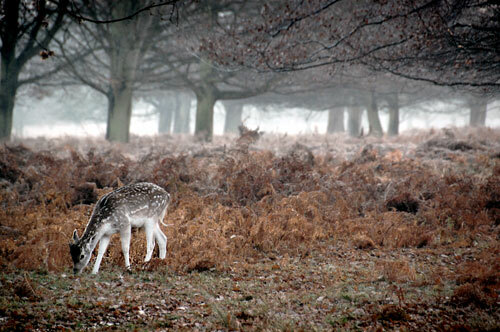 Approximately 300 Red deer and 350 Fallow deer roam Richmond Park in London. 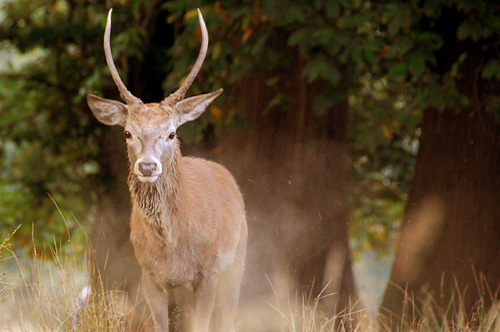 Richmond Park management cull the deer twice a year to keep the numbers under control. 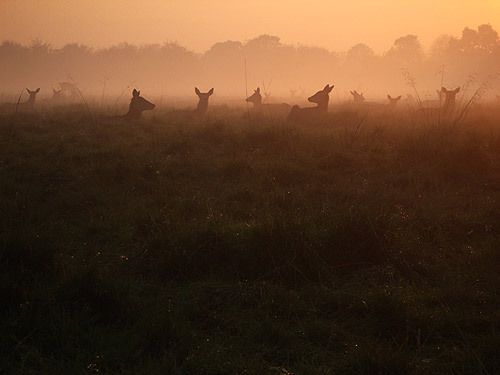 The best times to view and photograph the deer are early in the morning or late evening when the park is empty of visitors and the deer stop resting. 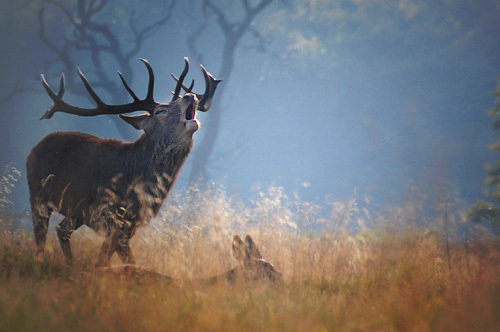 Autumn is particularly interesting as the stags rut and bellow to gain dominance over each other. These unique prints (and more) are available to buy online.